In order to enjoy the powder at the resorts, you have to get there first. When ski season finally arrives and you’re itching to hit the slopes, we’re the best wheels to get you there! Enjoy skiing at Big Sky Resort, Moonlight Basin in Big Sky, or Bridger Bowl in Bozeman, Montana. Does this month’s field trip involve a day trip to the ski resort? When you let the kids have a break from books, let us give you a break from driving. Having some downtime to interact with colleagues outside of the office is a great way to build morale and unity among your staff. When it’s time to party on the slopes, no one does group transportation like we do! Riding together is the best way to get lots of people to the resort without having to negotiate congested canyon roads. When it’s time to shuttle, it’s time to motorcoach! 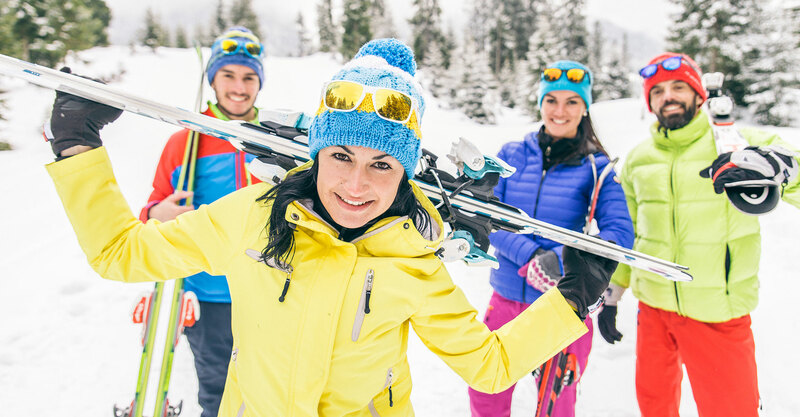 Enjoying crisp mountain air, camaraderie, and some exercise on skis can be the perfect addition to your executive conference retreat. When you mean business, motorcoaches are the best way to combine work and play. Skiing is a family pastime that connects generations. Choosing a coach means that grandpa, aunts, cousins, and sisters-in-law can all ride together, making it possible for the fun to begin before you even arrive at the resort! Combining a hobby with friends makes the experience that much more enjoyable. When everybody is getting together for a day of fresh powder and blue skies, call us so the group can ride together! From the first rickety wagons tied together with baling wire in 1902, to large taxis in the 1950s, to current luxury motorcoaches, Karst Stage continues to provide excellent transportation services to the people and visitors of Montana and the Western United States. Headed to the mountain with your group?